Roof Drains on Flat roofs are one of the most problematic objects. The positioning, design, and installation of a drainage system are one of the most important factors to have a relatively low maintenance roof. The average flat roof does not have an optimized draining system. Most of the time there is not a positive pitch to let water drain, and that causes ponding. Every roof is unique, and the drainage system should be customized for each roof. Things to consider when designing a Roof drains system. The easiest method is to multiply the roofs surface length by width. Example: A 30 ft. x 50 ft. = 1500 sq. ft. area. Do not subtract other surface areas from the roof size. It is not necessary to be accurate. If there is another roof that leads onto the roof you calculating the size of, then you need to calculate that roof’s size as well. What you want to accomplish is to calculate the catchment area surface of all the roofs that uses a common drain together. Step 2: Find the Rainfall rate for your area. International Code Council list the rainfall rates for larger cities in all 50 states. Use this as a reference. Using an average rainfall rate is effective. Again what we trying to do is calculate the volume of water that will accumulate from all the roof surface surrounding that particular drain in one hour. Drain sizes are from 2″ up to 8″ pipes. Most commonly 3″ and 4″ drains are used. 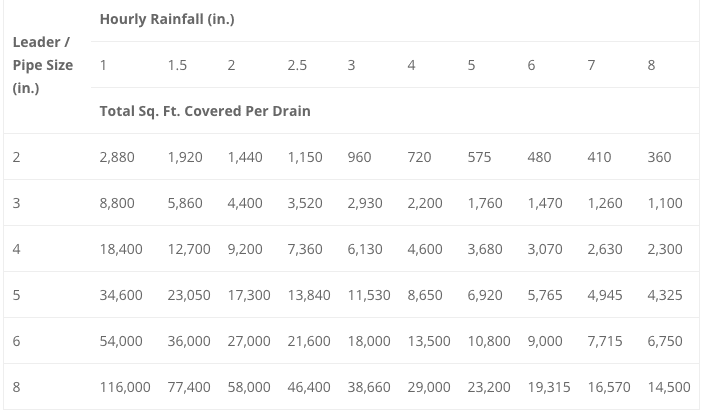 Here is a chart that can help with the calculation of size drains that will be needed per square foot area.